In the ancient Church priests did not wear crosses on the breast. The four-ended, gold breast cross was introduced in the Russian Orthodox Church as an award for deserving priests by the decree of Emperor Paul I on December 18, 1797. On February 24, 1820, by decree of the Holy Synod, priests who had served abroad received the right to wear a cross “from his Majesty’s Cabinet” — these crosses were known as “Cabinet crosses”. Beginning in the nineteenth century, deserving priests were awarded jeweled crosses and some archimandrites even received the right to wear the panagia . Finally, by the decree of Emperor Nicholas II on May 14, 1896, the silver cross came to be awarded as a mark of distinction to every priest. 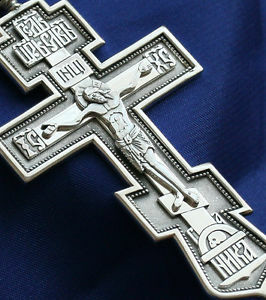 At the present time, the silver cross is given to every priest at his ordination while the gold cross (the cross described above as dating from the year 1797) and the jeweled cross may be awarded as a mark of special distinction or many years of service . In particular, the future Metropolitan of Moscow Philaret received this right while he was an archimandrite. Also, the famous church composer and theologian of the nineteenth century Archimandrite Theophan (Alexandrov) received this right. Until the year 2004 some clergymen in the Russian Orthodox Church received the right to wear two or three crosses, but that custom has since been eliminated.